These page provides answers to the following questions. What happens under the hood? Knowing about this last point is not essential for using IRMA; it only provides additional background information for people who wish to understand more about IRMA. Deze pagina geeft antwoord op de volgende vragen. The next diagram summarises the initial steps, when you wish to start using IRMA. It is wise to take a bit of time for this, since these steps require some care and attention. You are about to make a digital identity for yourself, which you can use in principle for a long time, for sensitive personal matters such as logging in or digital signing. This is a bit like applying for, and collecting, a passport. But such a passport requires much more time and effort, for instance because you have to visit your local authorities (twice). Just like a passport, IRMA is strictly personal: no-one else should be able to (ab)use your IRMA identity. The IRMA app is available via the Download page of the foundation. You can also directly install the IRMA app on your phone or tablet via the Android Playstore or the Apple App store. Please choose your PIN code with care. You will regularly need it when you use the IRMA app. This code guarantees that you are the only person who is using your IRMA app. Avoid obvious codes like 00000. If you write down your PIN code, please use a special place (or manner) so that others cannot get to it easily. The app asks you to re-type the chosen code, in order to avoid typing errors. Every time you authenticate with IRMA, by revealing IRMA attributes, this PIN code is required. Digital signatures also require it. Changing or retrieving your PIN code is (currently) not possible. If you loose your PIN code, you have to start all over and re-register. All the attributes that you have collected at that stage will be lost. This is a hassle. At registration you can optionally add an email address. It is advised to do so, because via such an email address you can block your registration at the foundation, on the MyIRMA webpage. Below more information will be given about this. Adding an email address is optional, not compulsory. If you do not add it, the foundation knows nothing about you except an automatically generated random username. You can see this username, after succesful registation, by tapping on “MyIRMA login” in the attributes overview in your IRMA app. When you choose to associate an email address to your account, please use an address that actually belongs to you — and to no-one else — and that you will be able to use for a longer period of time. You will immediately receive an email message at this address with a link for confirmation. In this way it is checked that the email address is under your control. In exceptional cases the email address may be used to contact you about usage of IRMA. The address is not shared with anyone else. The email address that you possibly submit upon registration can now be loaded into your IRMA app on your phone. After the previous registration steps, in which you have chosen your PIN code and email address, you will receive a link (webaddress) by email. By clicking on this link and following subsequent instructions, your email address will be added as attribute in your IRMA app. When you go in a webbrowser to the webaddress in this link (received by email), you will see an “Email Issue” button. It illustrates how issuing and receiving of attributes works. When you open the webpage in a browser on a PC or laptop and push the “Email Issue” button, a QR code appears. Now open the IRMA app on your phone and touch the “scan banner” at the top of the app. This starts the camera of phone, so that you can scan the QR code. Having done so, the app asks you if you wish to accept your email address as new attribute in your app on your phone. When you open the webpage in a browser on your phone itself and press the “Email Issue” button, the IRMA app on your phone opens automatically. You are also asked if you wish to accept your email address as attribute on your phone. After registration you can try out the IRMATube demo. It is possible to receive more attributes, in addition to your email address. You can do this immediately upon registration, but also later. To do so, please visit the IRMA issuance page. There you will see several possiblities to load additional attributes. This list of possibilities is not fixed, and will grow in the future, as more parties join IRMA. At this stage the focus is on attributes from Dutch sources. If you wish to join with other, possibly international, attributes, please do contact the foundation. iDIN provides attributes from your bank, like name, address, town, and date of birth. 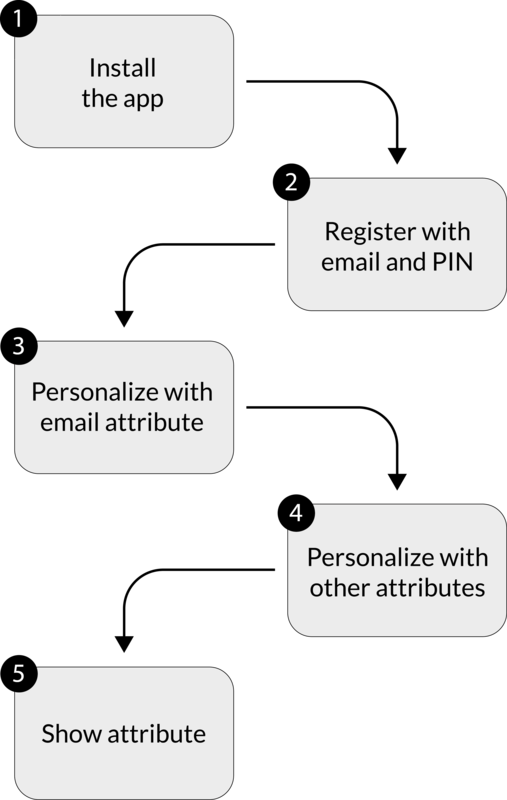 After logging into your own bank, with your the bank’s own login mechanism, these attributes can be loaded into your IRMA app. This service if available for everyone with a bank account in the Netherlands, see iDIN. SURFconext provides attributes from the (mainly Dutch) higher education sector. It is available, in principle, for students and staff members from educational institutes in the Netherlands, with a SURFconext registration. Your own institution will have to explicitly approve IRMA access. Via SURFconext “educational” attributes can be loaded into your IRMA app. 2. What does MyIRMA provide? The MyIRMA website of the foundation offers the following possibilities. You can monitor the usage of your own IRMA app: the log files can be inspected there. You can see when your app has revealed attributes and also when the app has received (loaded) attributes. However, it is not possible to see which attributes are involved: to which verifier you have revealed attributed, or from which issuer you have received attributes. The foundation does not want to know these matters, and therefore does not register them, and cannot show them to you. This is a consequence of the privacy by design character of IRMA. It is wise to check these log files from time to time. If you see there that your app is being used while you know nothing about it, something is wrong: someone else may be abusing your app in order to steal your identity. This is a reason to take action immediately. It brings us to the second possiblity that the myIRMA webpage offers. At the MyIRMA webpage you can disable (block) further usage of your IRMA app. Of course, you can do this at any moment when you no longer wish to use IRMA. In addition, however, it is important to be able to pull this “emergence brake” when your phone has been stolen, so that no-one else can abuse your identity. When you decide to terminate IRMA on the MyIRMA webpage, all your data will be deleted immediately, so that your IRMA app can no longer be used, even if it is sill installed on your phone. If, at some later stage, you choose to start using IRMA again, you have to re-register from the start. At the MyIRMA webpage you can also manage which email address, if any, is associated with your account. With IRMA itself, via your email attribute. By typing in your email address; you then receive a fresh link by email, which gives you access to your account. The latter, second option can only be used when you have (earlier) associated an email address with your account. This is especially useful when your phone is stolen (in which case the first option is not available). When you read your email on another device, you can login from there into MyIRMA and disable your account. Because of this second option it is wise to associate an email address with your IRMA account. 3. What happens under the hood? The text below dives deeper into what precisely happens when you register via the IRMA app. This background information is not necessary for actual usage of IRMA; it is intended for people who are more technically interested and like to know how things have been set up and how security and privacy-protection have been organised in the IRMA ecosystem. Even more information is available on a separate page. One essential point is that the IRMA app is strictly personal and should be protected against abuse by others. This happens via the personal PIN code that you choose at registration. Of course, it is theoretically possible that you hand over your phone together with your PIN code to someone else. It is equally unwise to share your bank card with PIN. No security mechanism can protect against that. It will thus be assumed that users keep their PIN code secret. The question is then: where is this PIN code stored? The same question holds for the secret cryptographic key that is required to let your app work for you. The IRMA implementation uses a split key trick, so that secret cryptographic information is distributed between the app and the MyIRMA server of the foundation. The app and the server have to collaborate in a precisely defined manner in order to make IRMA work. They each have too little secret data to achieve this alone: they have to cooperate and both use their own secrets for a joint computation. This is called multi-party computation. As a result, the MyIRMA server alone can never pretend to be you: the app on your phone is strictly required. What you can do on the server side is described above. Logging into the MyIRMA server can be done via IRMA, but also via a link that is sent by email. If your phone has been stolen, the thief probably also has access to your email. Hence he/she can log into your MyIRMA account. But the only thing that the thief can do there is disable your account. Hopefully, by then, you have already done this yourself. To summarise: the MyIRMA server offers additional protection and inspection, but cannot do anything on its own — except disable. 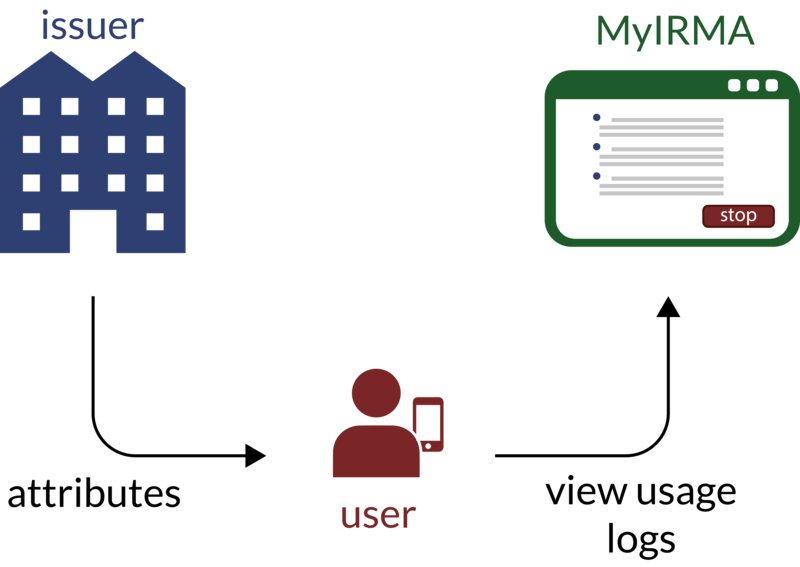 The Privacy by Design foundation operates the MyIRMA server in order enable the usage of IRMA. In principle, other parties can run such a server too. The MyIRMA server also helps to protect your PIN code. In general, it is unwise to store a PIN inside an app on a phone, because it could possibly be extracted when your phone is hacked. Therefore, the IRMA app does not store your PIN locally. Instead, it stores a large arbitrary number, called a nonce. Also the MyIRMA server does not know your PIN, but upon registration it receives from your app the hash value hash( PIN | nonce ). From this your PIN cannot be deduced. When you log into your app with your PIN code, the app computes the (large) number hash( PIN | nonce ), sends this hash value to the MyIRMA server, and deletes your PIN from its memory. If the hash value matches the number that the server stores for you, the app and server are connected, and your login has succeeded. A succesful attacker can possibly extract the nonce from your IRMA app, but that is not so useful. The only thing that the attacker can do is try out all 100,000 possible PIN codes: for each attempt X, the number hash( X | nonce ) can be computed and sent to the server. The server will notice such repeated attempts and will slow down the login attempts (rate limiting). The picture below summarises the two roles of the Privacy by Design foundation. On the one hand, the foundation issues several attributes for personalisation of your IRMA app. On the other hand, it operates the MyIRMA server, for inspection of your own IRMA usage and for possibly blocking your account. Initially, the foundation is the only issuer of IRMA attributes. Hopefully, other parties will follow. The foundation also verifies attributes, but only for itself, when IRMA users log into MyIRMA. Such verifications are not done for others. The foundation restricts its role to issuance and inspection.